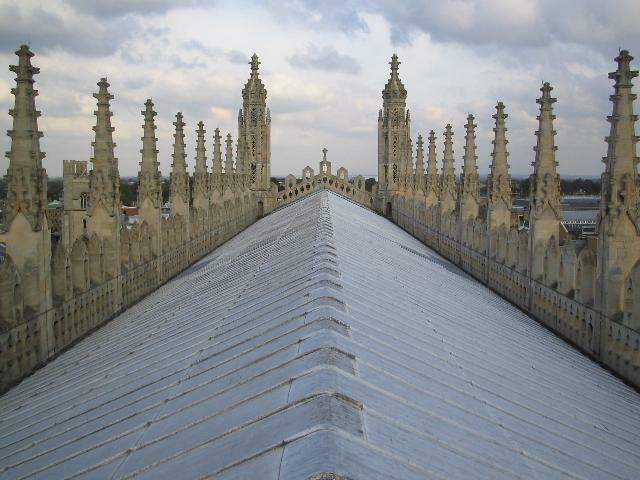 Roof view of King's College Chapel, Cambridge. Beautiful, isn't it? "Tracing this golden thread of wisdom and the inner need to maintain harmony in the world and within ourselves demonstrates how beautifully this principle has been woven into the fabric of Western civilization. Clearly the idea is not some wishy-washy, New Age invention of the late twentieth century. Far from it. It is a very precise priniple indeed acknowledged as central by some of the greatest thinkers the world has ever seen. From Pythagoras and Plato to Shakespeare and Ficino, from Giorgione, Bach and Handel to Wordsworth, Poussin and Blake, all of these great artists were very clear that there is a harmony to the world that must be maintained." - Prince Charles of Wales, from his latest book "Harmony"